This story has been updated with a video from a briefing held Wednesday afternoon in Rockland County. Hundreds of National Guard service members have been enlisted to assist areas impacted by the latest batch of winter weather as New York Gov. Andrew Cuomo declares a state of emergency in three Hudson Valley counties: Rockland, Putnam and Westchester. With between six and 18 inches of snow, and wind gusts upwards of 45 mph expected on Wednesday, Cuomo declared the state of emergency as the Hudson Valley braces for the fourth Nor’easter to hit in the past three weeks. The State Emergency Operations Center has also been activated to offer an assist to local governments as they dig out from the winter weather. A tractor-trailer ban also remains in effect. Cuomo noted that the New York State Department of Transportation is ready to respond with 1,555 large plow/dump trucks, 193 medium plow/dump trucks, 322 loaders, 40 truck/loader mounted snow blowers, 51 tow plows, 14 pickup trucks with plows, and 18 graders. In addition, the Department has more than 326,000 tons of road salt on hand. New York State Police will also increase their patrols during the storm in the areas most affected. They have ATVs available for deployment and troop emergency power and communications equipment has been tested. Metro-North will operate on a reduced weekday schedule, providing 75 percent of normal capacity, with some trains expected to be canceled during the evening commute. "As Mother Nature once again tests our great state, we have taken proactive measures in anticipation of the storm's heavy, wet snow that could impact power lines and cause dangerous travel conditions," the governor stated. 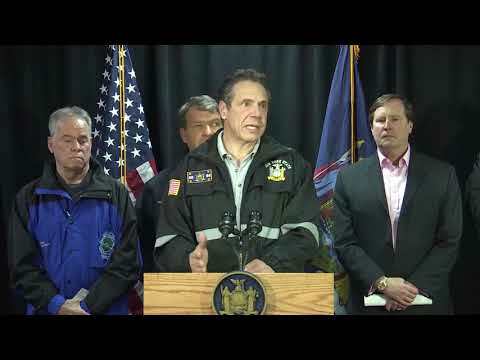 "I have activated the State Emergency Operations Center, National Guard members are being deployed, and I am urging New Yorkers to plan ahead for the harsh weather conditions expected throughout the rest of the day."